1. Tooth Sleuth. A fun game dreamed up by the staff at Princeton University’s Cotsen Children’s Library. Make a magnetic wand to aid tooth sleuths (try saying that three times fast!) in your search for lost teeth. 2. Music: Try singing Cousin Ruth’s Tooth to the tune of “Clementine.” Now try it with Rachel Fister’s Blister. What does this tell you about the rhyme scheme of the two books? f. Extra credit: Did anyone notice the “Quicker/Faster” sequence in Rachel Fister that’s echoed by the “Faster/Harder” one in Cousin Ruth? a. How long does it take for a new tooth to come in? b. What happens when you lose a grown-up tooth? Can you replace it? With a clay one? A wooden one? Do you think you can really rent or buy teeth (see double-page spread, where they’re shopping for teeth)? Why are the names of the stores on this page funny? c. Where do you think Ruth’s lost tooth really is? d. What does “Time heals all wounds” mean? How does it relate to the ending? 8. History: How did people deal with losing teeth in the old days? (Mention George Washington’s wooden dentures!) How did they pull teeth? What would it have been like to live in days when there was no “painless dentistry”? 9. Art: Make a tooth out of clay. Compare it to the illustration of Aunt May’s in the book. Is hers too big? Is yours? 10. Math: Make a graph of how many children in the room have lost how many teeth. Include grown-up teeth! 12. Drama: Put on a play, adapted from Cousin Ruth’s Tooth. 13. 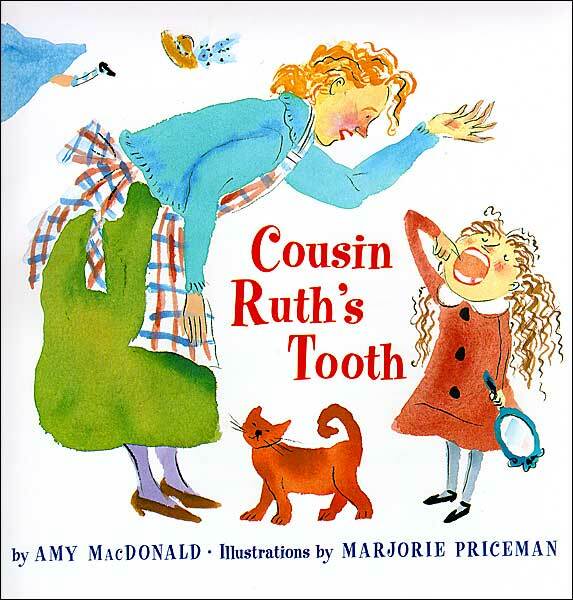 Drama: Do a Reader’s Theater read-aloud adaptation of Cousin Ruth’s Tooth. For instructions and a sample script, click here.